The city of Copenhagen has an interesting 'problem'. Despite 36% of the population riding a bike to work, the city has yet to reach it's goals of getting 50% of people commuting by bike. In 2008, to explore the possibility of alleviating this problem, the City of Copenhagen partnered with the SENSEable City Lab, a cutting-edge research group at MIT that studies the interface between people, technologies, and cities. At this time, Re:Imagine's creative director, Christine Outram, was working as a research associate at MIT and became the project leader for this work. 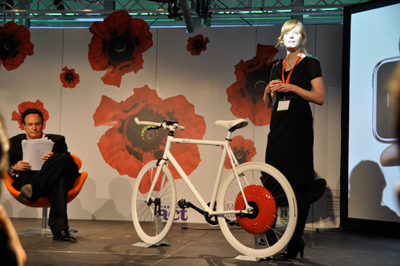 Over 12 months, she led the team that created the Copenhagen Wheel - a wheel that turns ordinary bikes into electric hybrids with regeneration and real-time environmental sensing capabilities. The wheel pushes the boundary of the 'Internet of Things' and in 2009, Re:Imagine's chairman, Peter Hirshberg, alongside Christine and the Copenhagen Wheel team, unveiled the wheel at the COP15 Climate Conference in Copenhagen.